Why should you must visit? This place is a 'must visit' because without it a visit to Gangtok is really incomplete. 'Marg' in Hindi means 'Road'. So MG Marg means MG Road ... all Indians will know that always an important road (if not the most important road) in any city or township in India would be named as Mahatma Gandhi Road or MG Road. 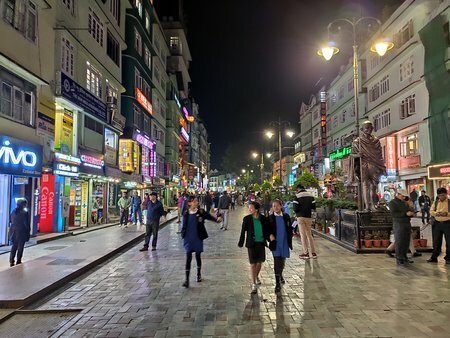 Gangtok is no exception and this is the town center of the hill town. The road and the area around it has transformed over the years. It is now more like a long stretch of open mall or boulevard square where locals and tourists take leisure stroll or just sit and relax on one of the many benches laid along the middle and both sides of the road to soak in the ambience. The road is lined up with glittering shops, restaurants, cafes & bars on both sides. Many tourists take a table on a roadside restaurant and watch the activities on the street. It's like a carnival like atmosphere out here. The annual Gangtok Food and Culture Festival is held here at MG Marg in December. The entire area is free of litter, smoke and vehicle. It's a pedestrian only zone and vehicles are not allowed on this approximately 1km stretch of the road. Smoking is not allowed either although I could not find any signs saying so. It seems all locals know it and will immediately warn you if you try smoking here. However I did notice a board right at one end saying 'Welcome to M.G. Marg, Spit and Litter Free Zone'. In line with government's green initiative, all buildings on both sides of this road are painted green. The Statue of Unity overlooks MG Marg. The statue comprises of the figures of Bhutia Chieftain Khye Bumsa, the Lepcha leader Thetong Tek and his wife Ngo-Kong-ngol. The statue depicts peace, love and harmony. About midway is an imposing statue of Mahatma Gandhi. There are Victorian lamps along this road. When lit up after dark, the entire place looks magical. As part of Gangtok Annual Food and Culture Festival that takes place in the month of December, many different food stalls are set up at the Titanic park in MG Road, cultural shows take place here opposite to Sikkim Tourism & Civil Aviation Department where ethnic dance performances and musical shows are organized. While there are numerous restaurants and bars on this road, some well known ones include the Baker's Cafe (great for coffee, pastries, patties, momos & other snack items), The Roll House located on a narrow alley off MG Road making delicious Rolls of different types, Parivar - a pure veg restaurant which almost always remains full, PUB25 - a popular pub, Rasoi - another upscale vegetarian restaurant etc. 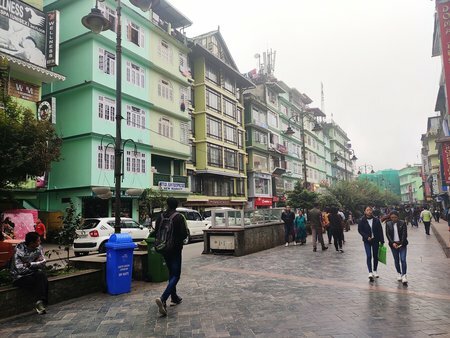 MG Marg is also the main market area of Gangtok. There are all sorts of shops here including souvenir & gift stores, clothing stores (for men & women), handicraft items, shoe shops, and even Pharmacies and convenience stores. Shops in MG Marg are open from 8am to 7pm. The market here is closed on Tuesdays. 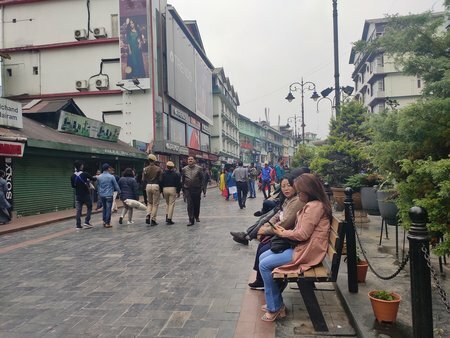 At one end of MG Marg is the Sikkim Tourism Center. Further down towards Tibet road is the taxi stand where you get taxis for local sightseeing tours. There are public pay & use toilets here (although they often remain quite dirty due to lack of water it seems. These toilets are also used as smoke rooms by some locals). Although smoking is not allowed on the main road, there are plenty of stalls along this road selling cigarettes - quite an irony.